Weather worth writing home about! What a fabulous spring week we have in store across the Mid-South! In the wake of a cold front over the weekend that brought storms Saturday night and cloudy and very cool weather on Sunday, high pressure is building in. This high will hold on for several days, making for some gorgeous days! High pressure is moving in not just at the surface, but well up into the atmosphere as well. This ridge of high pressure will help warm things up considerably over the central U.S. and then into the eastern portion of the country as we head into the week. In fact, highs in the lower 60s today will increase by about 10 degrees for Tuesday and several more degrees on Wednesday, putting the Mid-South near it's first 80 degree days of the year to end the week! The map above shows the jet stream level (about 34,000 feet) forecast for Wednesday evening, when the ridge of high pressure is directly overhead. If you look upstream though (to the west), you'll notice a large trough of low pressure over the west coast. This is what meteorologists refer to as a "highly-amplified pattern" - featuring large "peaks and valleys" in the upper levels. Under the large peaks, like the one over the Mid-South, warm and tranquil weather is usually found, while under and just ahead of the valleys, like on the west coast, stormy and cooler weather is typically present. The jet stream is indicated by the white arrow over the brighter colors, which are higher wind speeds. As that large trough approaches the region, it will bring our next round of unsettled weather. Computer models tend to agree that the magnitude of that trough will weaken as it moves east, but we're still looking for a frontal passage and accompanying precipitation sometime this Easter weekend, probably on Saturday. MemphisWeather.net will continue to watch the scenario unfold and the forecast will be updated with the latest expected trends. In the meantime, enjoy the beautiful weather! Before you know it, we'll be wishing we had the 70s back again! I found this morning's visible satellite imagery to be rather interesting, so I thought I'd share. The remnants of one system and the early signs of a second are shown on this Mid-South view. 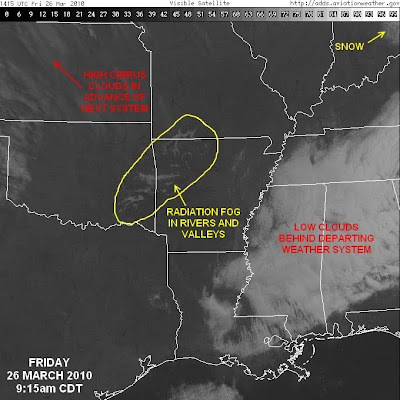 Note the low level moisture, in the form of stratus clouds, in the wake of yesterday's weather system over the Lower Mississippi Valley, Tennessee Valley, and interior southeast. As we know, the clouds broke up over the city this morning and you can clearly see at 9:15am that the back edge was right along the river and just to our north. Within an hour of that image, they began dissipating over Shelby County. You can also see very high wispy clouds starting to appear over the southern Plains as the next weather maker, which will bring us a round of thunderstorms Saturday night, organizes to our west. EFFECTIVE THIS THURSDAY AFTERNOON AND EVENING FROM 150 PM UNTIL 700 PM CDT. REMEMBER...A SEVERE THUNDERSTORM WATCH MEANS CONDITIONS ARE FAVORABLE FOR SEVERE THUNDERSTORMS IN AND CLOSE TO THE WATCH AREA. PERSONS IN THESE AREAS SHOULD BE ON THE LOOKOUT FOR THREATENING WEATHER CONDITIONS AND LISTEN FOR LATER STATEMENTS AND POSSIBLE WARNINGS. SEVERE THUNDERSTORMS CAN AND OCCASIONALLY DO PRODUCE TORNADOES. DISCUSSION...LOW TOPPED THUNDERSTORMS EXPECTED TO INCREASE RAPIDLY ACROSS THE WATCH AS STRONG UPPER VORT/COLD POOL ROTATES ACROSS THE MS RIVER IN TN VALLEY THIS AFTERNOON. SHEAR PROFILES WILL BE STRONG AND PARTICULARLY EASTERN PORTION OF WATCH SUPPORT ROTATING STORMS. WHILE INSTABILITY WILL REMAIN GENERALLY LESS THAN 1000 J/KG OF MUCAPE...THE STEEP LAPSE RATES AND STRONG ASCENT ALONG WITH SHEAR SUPPORT NOT ONLY MARGINALLY SEVERE HAIL BUT WIND DAMAGE. ADDITIONALLY IF SUPERCELLS ARE ABLE TO DEVELOP A BRIEF TORNADO THREAT AND LARGER HAIL WILL ALSO BE POSSIBLE. There is a slight risk of severe thunderstorms across the Memphis metro area later today as a spring low pressure system moves just north of the region. The time of greatest threat for severe thunderstorms, some of which could contain large hail or damaging thunderstorm wind, is between 10am and 4pm in the metro area, extending later for points east of the metro. 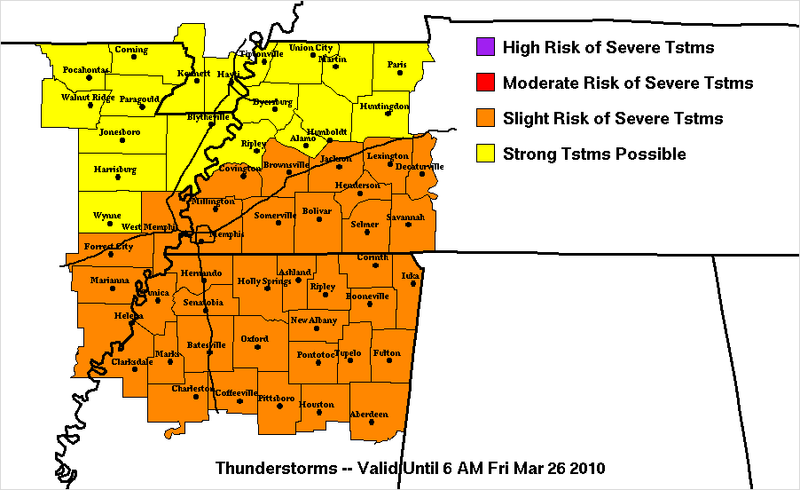 Stay on top of the weather situation today with radar, severe weather maps, and warning notification from MemphisWeather.net. Poll results: When will the last freeze be? As you can see from the results, nearly half of the voters said that we have already had our last freeze. 3-4 votes each were cast for this weekend's cold weather and the last week of March. A couple people went out on a limb and said early April (and a couple even later!). Given that the expected low on Monday morning will be around 35, I now believe that we have seen our last freeze and the official "growing season," as well as mosquito season, has begun! Spring is here - or is it? While it is now officially spring (it began at 12:32pm CDT today), a significant winter storm system is moving across the southern plains towards the Mid-South. Some places in the southern plains are seeing several inches of snow from this low pressure system! This storm will bring wet conditions to the Memphis and Mid-South region beginning tonight and lasting through Monday. As the low draws closer tonight, rain will move in after dark, probably between 10pm and midnight, then intensify late tonight and early Sunday. Temperatures tonight will fall through the 50s, reaching the upper 40s by morning. The rain will taper off late in the morning following the passage of a frontal system, however temperatures will continue to fall, rather than climb, on Sunday - dropping into the lower 40s in the afternoon with scattered showers. Sunday night is when things could get interesting. The low pressure system will stall out over the region, with a reinforcing upper level low moving into the picture. The upper low will move by to our south, but will bring a shot of cold air and another round of precipitation Sunday night. Under the core of the low, temperatures could be cold enough for wintry precipitation (snow or sleet) to mix with the light rain. As it stands now, I expect the best chance for any wintry mix to be to the SOUTH of the Memphis area, over northern and central Mississippi, and under the low itself. Given that, though, enough cold air will be close by that we could see light sleet or snow Sunday night in the Memphis area. Remember that it has been 70 degrees for three days leading into this event, so the ground is warm enough that accumulation will not occur. Monday morning temperatures will be in the mid 30s, rising only into the upper 40s during the day as the lows move east, leaving sprinkles or a light shower and cloudy skies behind. Rapid improvement takes place Tuesday and Wednesday ahead of the next storm system on Thursday. The first day of spring occurs on Saturday, March 20, this year. 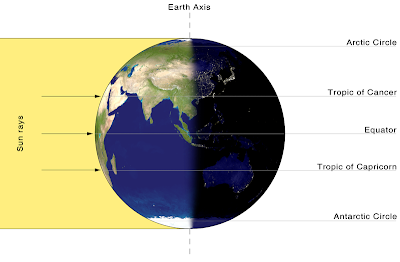 The vernal equinox, or the time when the sun is directly over a point on the Equator and the tilt of the Earth is negligible, occurs on Saturday at 1732 GMT, or 12:32 pm CDT. Contrary to popular belief, the equinox does not ensure an equal amount of daylight and darkness for every point on Earth. In fact, for Memphis, our days started becoming longer than our nights on Wednesday (March 17) when we had 12 hours and 1 minute of daylight (sunrise to sunset). On Saturday, the first day of spring, we'll actually get 12 hours and 8 minutes of daylight - pretty close to that "equal daylight and darkness" mark though, so you can understand the origin of the myth! While Saturday will certainly feel like spring, with highs near 70, Sunday will be a much different story, as late winter returns for one last gasp. As typical with early spring though, as the sun moves to a position farther north of the Equator, it's rays tend to warm things up pretty quickly after a cold snap, and that is expected to occur early next week. Spring, then winter, then spring again! I wrote earlier this week about a storm system we would have to keep an eye on this weekend. It's Thursday evening and time to talk about it! Computer models have pretty much been all over the place with this system the past couple of days, so I have been hesitant to say too much about it, other than monitoring it closely and keeping the forecast udpated. Well, today we started getting some agreement in the models, and it seems that there is good news and bad news. Bad news: This pushes much of the effects of the system into Saturday night and the daytime hours Sunday. Those effects include showers and thunderstorms, some of which could produce strong wind gusts, Saturday evening and overnight and scattered, mainly light, rain showers Sunday. We also will likely see temperatures do a nose-dive from 70 Saturday to the 40s on Sunday. Temperatures may actually be at their warmest Sunday morning before falling slowly through the 40s during the day. Needless to say, it will be a dreary "winter-like" day. Other good news: While some model solutions had mentioned a four-letter precipitation type that begins with 'S' on Saturday night or Sunday, I now think that the chances are very slim. I had not put it in my forecast up to this point due to it being so late in the season and model solutions not agreeing on that outcome to this point. It appears I may have been wise in doing so. I'm sticking with rain on Sunday. Last bit of good news: Typical with mid to late-March systems, the cold blast doesn't last long and we're rebounding back into the 60s to near 70 early next week. Check out all the details in the MemphisWeather.net forecast. This week (March 15-19) has been designated by NOAA as Flood Safety Awareness Week. Flooding/flash flooding is the #1 cause of weather-related fatalities in the United States each year, more than tornadoes, lightning, and hurricanes (NOAA/NWS). According to the graphic released by NOAA (above) this week, much of the Mid-South is in an "above average" risk of flooding this spring thanks to saturated soil conditions, dominant weather patterns, and likely also the record flooding expected upstream in the Red River Valley, which feed downstream into the Mississippi River. Flash flooding occurs quickly, typically due to torrential downpours, dam breaks, etc. and can occur with little warning. 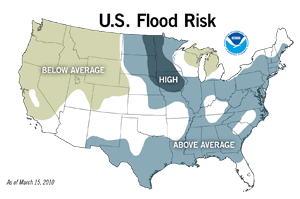 (Non-flash) flooding usually takes place over a longer period of time, such as with prolonged rain or spring snowmelt. The expected near-record flooding around the Red River in eastern North Dakota and western Minnesota this spring is an example of snowmelt and spring rains combining to send the river over its banks and into neighboring towns, cities, and rural land. The National Weather Service issues watches and warnings for both types of flooding. 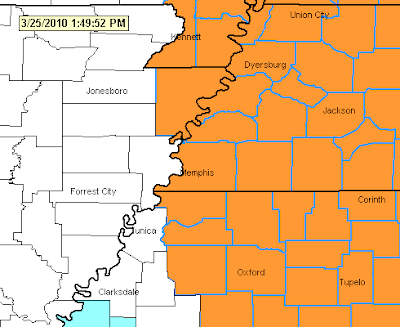 Typically in the Mid-South, Flash Flood Watches and Warnings and Urban/Small Stream Flood Advisories are a result of copious rain from thunderstorms over a short period of time, usually in the spring and summer months. 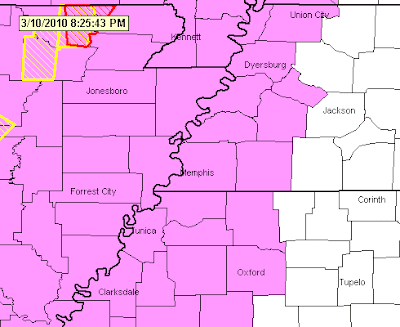 Occasionally, Flood Watches and Warnings are issued for the Mississippi River (usually in the spring) when melting snow and spring rain up north cause the river to overflow its banks in the Mid-South. The NWS slogan used to educate people on the dangers of flooding is "Turn Around Don't Drown." The TADD campaign reminds people that 18-24" of flowing water is enough to sweep a car off the road into unknown hazards like swollen creeks. During Flood Safety Awareness Week, MemphisWeather.net reminds you to exercise caution when water covers the road or when recent rain has caused drainage ditches, creeks, and streams to become rushing torrents of water. Most of the time, deaths due to flooding are entirely preventable. Don't become a statistic. You can receive Flash Flood Watches and Warnings by e-mail by signing up for MWN's WXLIVE!-Severe Weather warning notification system or by following @shelbyalerts on Twitter. Certainly NOAA Weather Radio and commercial media outlets also provide this valuable and life-saving information. When will Memphis get its last freeze of the spring? The last freeze at Memphis International Airport was March 5, 2010, when the temperature briefly touched 32 degrees. It's now March 15th. Our typical "last freeze" date in the city is March 22nd, though in the suburbs and outlying areas it averages a few days later. (The last freeze for most suburban areas was March 6th, when the airport bottomed out at 33.) Of course, a frost is likely even later than these dates as temps in the 30s are still possible until the first of April on average. This averages out to March 19th , slightly earlier than the 30-year climatological average. So, are freezing temps over for the Memphis area until later this fall? The latest MWN Forecast does not show any freezing temps through March 29, however a system this weekend could pack a cold punch behind it. Depending on the exact track of the system and the strength of the cold air behind it, cold temperatures are not out of the question Sunday or Monday morning. Here's a chance for you to be the forecaster! Vote in MWN's unscientific webpoll! When will we have our last freeze? Just as the Mid-South started to get a taste of spring last week, and even a round of severe thunderstorms on Wednesday night, the weekend was a reminder that it is technically still winter. Cloudy, gray days, patchy showers, and cool temps greeted the area, thanks to the influence of a very strong low pressure system on the east coast that brought tropical storm-force wind, buckets of wind-swept rain, hundreds of thousands of power outages, and hundreds of cancelled flights to the major metros of the Northeast. Currently, we're still sitting between this system, which continues to hang around in the eastern Atlantic, and high pressure over the Northern Plains. This will mean another semi-gray day, with maybe a few more peeks of sun and less shower activity than yesterday, and high temps in the upper 50s with a cool northerly wind funneling into the region between these two weather systems. Tomorrow will see more sun, though not completely sunny, and similar temps near 60 as the low loses some of it's influence. By St. Patrick's Day on Wednesday, an upper-level low pressure system will bring the clouds back and provide a slight chance of light rain with temps still near 60. Conditions definitely improve by Thursday and Friday as high pressure moves to our southeast, bringing warm wind off the Gulf of Mexico back into the region and allowing high temperatures to approach the 70 degree mark by week's end. For the weekend, it appears we may be in store for another springtime storm front. Details are still being ironed out, but I went ahead with "likely" chances of showers and thunderstorms Saturday in the MWN Forecast, as one way or another there's a decent bet we'll get some rain. We'll continue to monitor as the week goes along, as I know there are some fairly major events planned for this weekend in the city. As a reminder, and as posted earlier, MWN underwent some cosmetic changes this weekend that required changing the URL's of nearly all pages on the site from .html pages to .shtml pages. Please change your bookmarks accordingly. The front page of the site is still http://www.memphisweather.net/, but if you bookmarked the front page with index.html, you need to change it to index.shtml. For the next couple of weeks, it will automatically forward you to the right page. Cirrus Weather Solutions will be taking the first step in a partial re-vamp of MemphisWeather.net. You will see very few "visible" changes to the site itself with this initial step. However, there will be changes to nearly every page's URL (or web address) in that the .html portion of the URL will change to .shtml. This change will allow updates to the static portions of the site (i.e., the page header, footer, menus, etc.) to be made much more easily and enable the site theme to be kept uniform going forward. What does this mean to you? The main thing will be that if you have bookmarked individual pages of MemphisWeather.net (pages ending in .html), you will need to modify those bookmarks to read .shtml. The rest of the page URL will remain the same. Going directly to the front page of the site (http://www.MemphisWeather.net) is certainly the best way to access pages within the site, as the changes being made will be transparent to you. The website maintenance window will be tonight (March 13) between 9-10pm CST. There could be partial outages of the site during that time. Moving forward, additional changes will be relayed as they are made. Thanks for your continued support and patronage of MemphisWeather.net! EFFECTIVE THIS WEDNESDAY NIGHT AND THURSDAY MORNING FROM 750 PM UNTIL 200 AM CST. TORNADOES...HAIL TO 2 INCHES IN DIAMETER...THUNDERSTORM WIND GUSTS TO 70 MPH...AND DANGEROUS LIGHTNING ARE POSSIBLE IN THESE AREAS. DISCUSSION...SEVERE TSTMS /INCLUDING SUPERCELLS/ ARE EXPECTED TO DEVELOP OVERNIGHT WITHIN MOISTENING AND INCREASINGLY SHEARED ENVIRONMENT ALONG 40-50 KT LLJ AXIS. THE MOST INTENSE STORMS WILL BE CAPABLE OF LARGE HAIL AND ISOLATED TORNADOES. The severe weather threat for tonight continues. As of 2pm, temperatures have reached the mid 70s as projected and dewpoints (a measure of the amount of moisture in the air) have remained in the upper 50s. The heating of the day, combined with plenty of moisture for early spring, an upper-level system moving closer to the region, and a mid-level jet stream will work together to set the stage for possible severe weather. 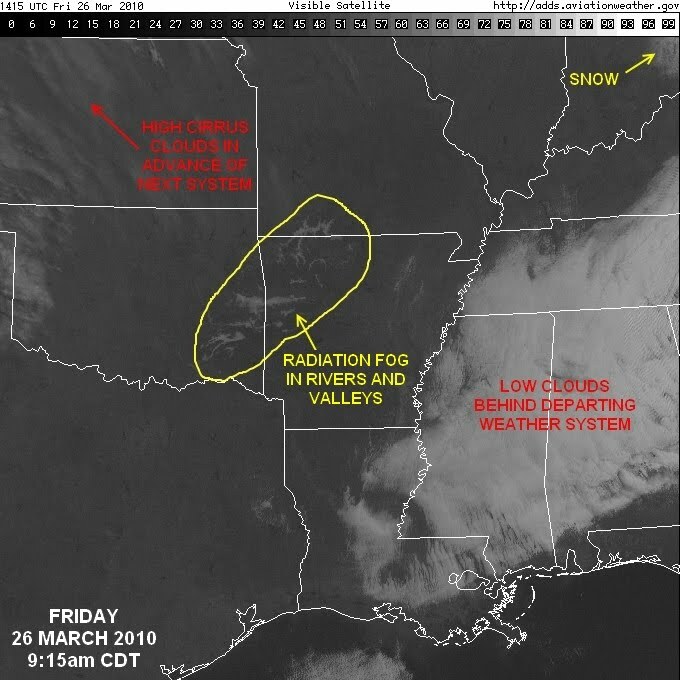 Severe thunderstorms have already started forming in northeast TX and are moving northeast, while additional development across OK and western AR is expected in the next couple of hours as the upper-level shortwave approaches. Individual supercell storms will likely bring a fair amount of severe weather to much of AR this evening and early tonight, then coalesce into mini-lines, or perhaps a single squall line, of storms as it moves towards the metro area overnight. 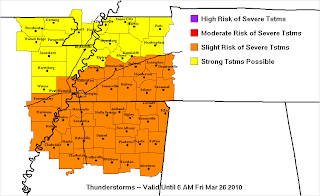 The most likely time for severe weather appears to be in the 11pm-4am time frame for the Memphis area, with the possibility of large hail (up to the size of quarters), damaging thunderstorm-generated wind gusts of 60 mph+, and even isolated tornadoes. Make sure that if you have a NOAA Weather Radio, it has good batteries before going to bed tonight. Another option for Twitter users - you may wish to receive automated weather alerts (if you are in Shelby County) by following @shelbyalerts and set it to alert your mobile device. Weather alerts are the only messages sent to that Twitter account. You should also review severe weather safety tips, since this is the first potential severe weather episode of the spring. They can be found on MemphisWeather.net. MWN's severe weather map will also automatically update as any severe weather bulletins are issued and, of course, StormView Radar will help you track the storms, the warnings, and any severe weather indicators detected by the radar. 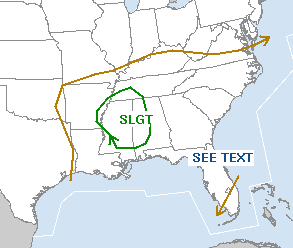 THERE IS A SLIGHT RISK OF SEVERE THUNDERSTORMS FROM LATE THIS AFTERNOON THROUGH TONIGHT ACROSS THE ENTIRE MID-SOUTH. THE GREATEST POTENTIAL FOR SEVERE WEATHER WILL OCCUR ACROSS EASTERN ARKANSAS BETWEEN 4 PM CST AND MIDNIGHT. THE SEVERE WEATHER POTENTIAL WILL INCREASE ACROSS WEST TENNESSEE AND NORTH MISSISSIPPI AFTER 9 PM CST AND CONTINUE THROUGH THE EARLY MORNING HOURS OF THURSDAY. THERE REMAINS THE POTENTIAL FOR DAMAGING WINDS IN EXCESS OF 60 MPH... LARGE HAIL UP TO THE SIZE OF QUARTERS... AND ISOLATED TORNADOES. IN ADDITION... HEAVY RAINFALL OF 1 TO 2 INCHES MAY CAUSE LOCALIZED FLOODING. Stay tuned to MemphisWeather.net and commercial TV and radio outlets, as well as NOAA Weather Radio, for the latest on the possibility of severe weather. The Memphis metropolitan area has been placed under a SLIGHT RISK of severe weather for the Wednesday late afternoon and overnight timeframe (see top graphic above). The Storm Prediction Center expects storms to break out to our west Wednesday afternoon as strong heating and approaching low pressure combine. These storms will move into east Arkansas by evening and will impact portions of the area after dark. The greatest threat of severe weather (see bottom map above) is expected to be over Arkansas. Storms are expected to be linear in nature (perhaps multiple lines of storms) posing mainly a damaging wind and large hail threat, though isolated tornadoes cannot bu ruled out in any discrete storms that form. MemphisWeather.net will continue to monitor the situation and provide updates as warranted. Stay tuned to the MWN Forecast, this blog, and MWN on Facebook and Twitter, for the latest on possible severe weather in the Mid-South. What a pleasant weekend and fabulous start to the work week! After highs in the 60s Saturday and Sunday, we finally put an end to the sub-70 degree weather steak we were working on with today's high of 74 (as of 3pm). The Memphis airport ended up with 112 straight days of highs below 70 (which started way back on Nov. 16, 2009), which ranks 7th all-time and the longest streak in 79 years! Certainly a streak I was ready to see go by the wayside! The rest of the week will be unsettled at best, with rain chances each forecast period through perhaps Saturday. However, don't expect continuous rain the whole week. The first shot at precipitation in the form of showers comes late tonight as moisture surges ahead of low pressure over the plains and a weak front moves into the region Tuesday. Most rain will fall between midnight tonight and noon Tuesday. Wind will also pick up and become gusty Tuesday. With plenty of cloud cover, it will be mild tonight and Tuesday, but not as warm tomorrow as today's mid 70s by any stretch. We'll see just low rain chances Tuesday afternoon through Wednesday afternoon with continued mild conditions. In fact, with a little break between systems Wednesday, Mid-Southerners could once again see temps break into the 70s with a little PM sun and warm southerly wind. This comes ahead of the next frontal system that moves in Wednesday night and early Thursday when the next round of rain appears on the radar. Some thunder is certainly possible, though severe storms would be few and far between it appears right now. Behind this system, low pressure moves very slowly by to our north in the Thursday-Friday-Saturday time frame, meaning cooler weather, plenty of cloud cover, and low shower chances into the latter part of the week and early this weekend. I'm forecasting a little more sun Sunday and Monday, though it remains cool. For the complete forecast from MemphisWeather.net, click here. For those traveling to Tulsa to watch the University of Memphis play in the C-USA men's basketball tourney later this week at the BOK Center, look for a chance of showers each day and highs in the mid 50s, lows in the upper 30s. Details from the NWS can be found here. The MWN Forecast began 2010 where 2009 left off - with the most accurate temperature and dewpoint forecasts for the month of January as compared to the available computer models and the National Weather Service. For the month, the average temperature error in all MWN forecasts was 2.53 degrees, or almost half of a degree better than the NWS and 0.59-0.64 degrees better than the GFS and NAM computer models. For dewpoint accuracy, the MWN forecast was also the best of the data sources at 3.29 degrees average error. The month of February continued the streak of highly accurate forecasts, once again producing more accurate temperature and dewpoint forecasts than the available models and the NWS. For the month, the average temperature error for MWN forecasts was 2.39 degrees, as compared to the NWS at 2.59 degrees and the NAM and GFS at 2.70 and 2.98 degrees, respectively. The average dewpoint error of 2.66 degrees was also 0.20 degrees better than the closest forecast model. Many of you who know me, visit MemphisWeather.net, and/or read this blog on a semi-regular basis know the passion that I have for the weather - following it, reporting on it, studying and analyzing it, and marveling at it. It's been "in my blood" since middle school (perhaps even earlier) and is something that brings me joy each day. Perhaps it's because no two days are exactly the same or because there is so much that is unknown that it provides plenty of opportunities for personal and professional growth along the way. While my horizons have expanded, so too have my weather offerings to Mid-Southerners - via the websites, blog, and expeditions into social media. As I looked for new ways to bring you the weather information that you require and have requested, I realized that I needed to become better organized in the manner in which I provide this worthwhile information and to more properly formalize the efforts I have undertaken. Thus, it is with great pride that I officially introduce Cirrus Weather Solutions, a private meteorological firm I started, that will serve many purposes, not the least of which is as the umbrella organization for MemphisWeather.net and JacksonWeather.net. Cirrus Weather Solutions was actually founded on February 5, 2010 - National Weatherperson's Day and the two-year anniversary of the Super Tuesday Tornado Outbreak. Strong tornadoes on that presidential primary election day devastated portions of the Mid-South, including Southaven, MS and Hickory Hill, parts of rural northeast Shelby County, as well as the Union University campus and surrounding areas in Jackson, TN. It seemed like an appropriate day to officially commence operation of a business devoted to keeping Mid-Southerners informed on weather regimes that affect the region. MemphisWeather.net (or MWN) is one-of-a-kind - the only internet-based media entity that focuses solely on Memphis and Mid-South weather. It serves the Memphis metropolitan area (specifically Shelby, Tipton, Fayette, DeSoto, Marshall, and Crittenden counties) with more weather information than you can shake a stick at! 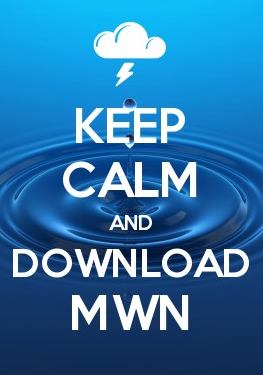 While other companies/organizations and traditional media maintain a web presence to deliver SOME of their weather information, MWN relies on the internet and other electronic means to deliver ALL of its products and services to the local and regional community, making them easily accessible and always available. JacksonWeather.net (JWN) serves essentially the same purpose as MWN, only for the remainder of west Tennessee, with a special focus on the Jackson/Madison County area. JWN once again delivers superior products and services to the good people of west Tennessee and is accessible around the clock. Between the two sites, hundreds of thousands of visitors a year have come to rely on the accuracy, timeliness, and breadth of weather information available for all of west TN and the Memphis metro area. Cirrus Weather Solutions will allow me to make even greater improvements to these sites, as well as enable future expansion efforts to take place. Part of the master plan is to eventually add additional (city)weather.net sites, specifically serving more locales in greater detail. I encourage you to keep up with the latest services and new and improved products by following the MWN Blog, as well as the MWN Facebook and Twitter sites. By following MWN on social media, you will be the first to hear about new products and services from Cirrus Weather Solutions and will likely get a chance to test some of these before the general public sees them. You can also get on the inside track by joining the MWN Updates mailing list. Sign up to be on this in-house mailing list on the front page of MemphisWeather.net. Your information will never be given or sold to anyone else! I also encourage everyone who follows MWN or JWN to pass the web addresses on to their friends, family, and co-workers in the area. More visitors will mean a greater ability to provide all with the best weather services possible! If you have any questions or comments, or wish to advertise on a Cirrus Weather Solutions-owned website, feel free to get in touch with me through the contact page on MemphisWeather.net. You will receive an initial response within 24 hours. I look forward to continuing to serve Mid-Southerners with the best weather information possible for many years to come! Very cold weather ended the meteorological winter season in Memphis. At Memphis Int'l Airport, the average temperature for February was a cold 37.4 degrees, which was 7.5 degrees below normal and ties for the 11th coldest February on record (since 1875) and the coldest since 1978. The highest temperature for the month was 66 degrees on the 21st and the lowest was 23 on the 16th. As of February 28, the airport had not seen a 70 degree day since November 15, 2009, a string of 105 days, which ranks 8th longest since 1875. There were 22 days that the temperature dropped below freezing for the month, though no temperature records were set in February. Overall, precipitation was a little below normal for the month, though snowfall was above the long-term average. The airport recorded 3.87" of precipitation for the month, which was 0.44" below normal. Total snowfall for the month was 5.4" (average of 2.2"). The greatest 24-hour total was 5.0" on the 8th (which was a record for the date), continuing into the 9th with an additional 0.2". Snowfall of 0.2" also occurred on the 14th and there was a trace on the 15th. The peak wind gust was 40 mph, recorded on the 21st. Click here for the NWS climate recap for February. For the "winter" (defined in meteorological terms as December, January, and February), the average temperature of 38.5 degrees places the 2009-2010 winter as the 13th coldest on record. The average temperature for February at the WXLIVE! station in north Bartlett was 35.8 degrees, with a maximum of 66.0 on the 21st and a minimum of 18.1 degrees on the 17th. February precipitation totaled 3.45" at the automated WXLIVE! gauge, while a co-located manual gauge used for the CoCoRaHS program measured 3.70". The peak wind gust was 33 mph on the 21st. Snow and sleet totaled 6.4" on the 8th/9th and another 0.3" on both the 14th and 15th. Click here for a daily statistical recap on MemphisWeather.net. The Saffir-Simpson Hurricane Scale, which has been in existence as is since 1975, will be undergoing a change for the 2010 tropical season. The new scale, renamed the Saffir-Simpson Hurricane Wind Scale, will de-couple storm surge, central pressure, and flooding impacts from the hurricane scale. The new scale will still use the same catgories - from 1-5 - to rank hurricane intensity, however the hurricane category will be determined only by sustained wind being produced by the storm. The degree of flooding, minimum central pressure, and storm surge will be included in tropical statements, however their values will not be "canned" based on the category of the storm, but forecast independently. Though there are "expected" values for storm surge and flooding based on the wind speed, it has been concluded that there are many other parameters that more accurately determine the expected flooding impacts and storm surge associated with a land-falling storm. For instance, storm surge values are dependent on a unique combination of a storm's size, intensity, motion, barometric pressure, depth of nearshore waters, and local topography. For more infomation on the new scale, visit the National Hurricane Center's webpage on the scale. In addition, a summary table showing the approximate damage and impact to various structures by hurricane category can be found here.